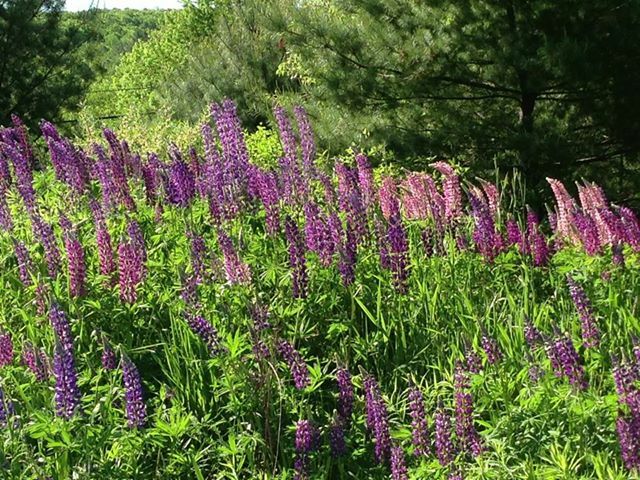 Driving along the interstate in Maine right now this is what you see: lupines! They are such contrarian, persnickety plants. Dig one up by its roots and transplant it in a carefully tended garden filled with rich, composty loam, and they'll perish. But toss a few seeds along the side of the road, or among rocks on a steep slope (I'm thinking Saddleback Mountain, for example, where the lupines grow thick) and they take over. I have a few in my front, full-sun beds, and I try not to over-love them. As soon as they sense you hovering they twist in the opposite direction. Wilt just a bit. A detached, almost indifferent gardener, does well for lupines, which are remarkably like teenagers. It's amazing to observe when teenagers open up and when they shut down. You know that glazed over look? As if you've become a Human Power Point Presentation. Dullness incarnate. I try to avoid it at all costs professionally. As a visiting author meeting students at schools, one of the strategies that's worked for me is to get the kids talking about slang. Specifically, their slang. Now, I'll warn you: be prepared for the explosion. It's very hard to control the conversation once the kids get going. I've seen teachers become visibly nervous as the responses become increasingly animated, everyone starts talking at once, and the decorum which usually accompanies a visiting author visit breaks down. But oh my goodness, this is fun. And if you write for kids, it's like mining and striking gold. Two new words I picked up at my last school visit: swag and dime. "Oh, I know swag," I said, when the kids told me about it. "That's like if you go to the Vanity Fair after party at the Academy Awards, and there are all these gift bags at your seat at the table filled with expensive chocolates or cosmetics. That's swag." The kids burst out laughing. "Uh, no. Swag is like, game. As in swagger. A really hot, cool guy has swag." Their teacher, my contemporary, spoke up. "So you'd say, 'He's so swag," she said. The kids laughed again. "It's a noun," they explained patiently. (I know: how could we be so dumb?) "He's GOT swag." "Oh my god, don't tell her that!" another said. "That's so wrong!" Note: be aware that there are always a few jokers out there who want to steer you in the wrong direction. Always kid-test your slang with trusted kid readers before inserting into your kid novel. "But you know, you could have a character that says swagalicious, which is how we see that he's a total nerd trying to sound cool but getting it completely wrong," one student suggested. Note: I may very well use that. Brilliant suggestion. Then, there was dime. I had no clue. After swag, I certainly wasn't going to suggest that they were referring to currency. "Dime means great. Ten out of ten. She's a dime," the kids told us. "He's so dime?" the teacher suggested. This did not even draw laughter. More like sad shakes of the head. Before I fire up the computer and plug my newly learned slang into whatever story I'm writing, I usually run it by my own kids. However, my kids are no longer ... kids. They are college-age young adults. The marketing target of the genre most recently dubbed "new adult." And not only have they never heard this middle and high school patter ... they have their own. Which brings me to Woo Girls and biddies. Biddies, I have learned, while they might "woo," are not Woo Girls. Biddies are the counterparts to bros, (who are commonly male pals, buds, good friends, but the term can also apply to alpha male idiots who are posers) and they are NOT about girl power: they are about the guys. Their compass on a Saturday night points "guys." They make plans based on where the guys will be. A biddy will ditch her girlfriends in an instant in pursuit of a guy. Strong women disdain biddies, I am told. This was not the definition of a biddy as I knew it. I thought it was an old lady. And it is, in Webster's. I was also informed that a biddy will usually dress provocatively, and might be spotted in Lulu's. Which, for those who care, are very expensive leggings which one wears to supposedly work out, but that true athletes scoff at.